Just a year after arriving in Canada as an internationally trained teacher, Aina Arora not only got a job in her field, but received an award for it. 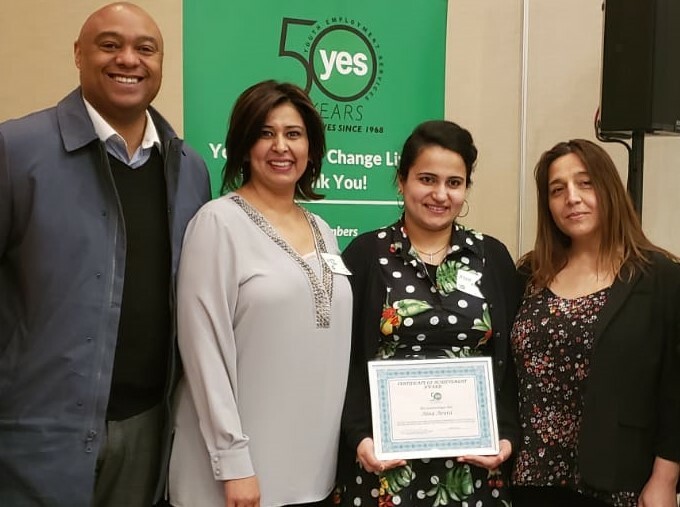 Arora, who arrived in Canada on March 23, 2018, from India with her husband and young daughter, is the winner of the 2019 Youth Achievement Award from Youth Employment Services (YES). Arora was an assistant professor in India for more than four years. Back home, she was known for her research skills and ability to guide young minds.. She was very confident about continuing her career in Canada, but soon realized the transition would be much more challenging than she had at first anticipated. Upon her arrival, she felt immense pressure to find affordable housing and a job to help support her family. The stress of being able to find a job in her field in Canada took a toll on Arora. She couldn’t sleep or eat, and started to get headaches, something she never experienced back home. She also stopped talking to her relatives back in India so they wouldn’t know how badly her integration in Canada was going. Her journey took a turn for the better when she found DIVERSEcity Community Resources Society. “DIVERSEcity was so welcoming and encouraging that it made me think again about my future as a teacher in Canada,” she says. Arora signed up for the Future Leaders Program, a youth-focused employment program. The employment specialists provided face-to-face and on-call sessions to help her decide what path she should go on. They helped her create a professional email account and resumé, and ran employability skills training.Later, she enrolled in classes for her TESOL diploma to become an English as a second language (ESL) teacher. Before she even finished her diploma, she landed her first job! But it was only part time and she wanted a full-time position. She became discouraged again when she found out that a teaching licence is required to teach in the BC school system. “But in my touch-back sessions at DIVERSEcity, I was encouraged to apply for job postings at [private] schools.” Finally, all her hard work paid off and she got a call from an independent school and was shortlisted for a position. The Ministry of Education provided her with a letter of permission to teach without a licence for one year. Today, she is working as a Grade 6 teacher at Khalsa School Newton. Arora overcame so many struggles in achieving her goals, but she never gave up, and receiving the Youth Achievement Award is a perfect testament to that.